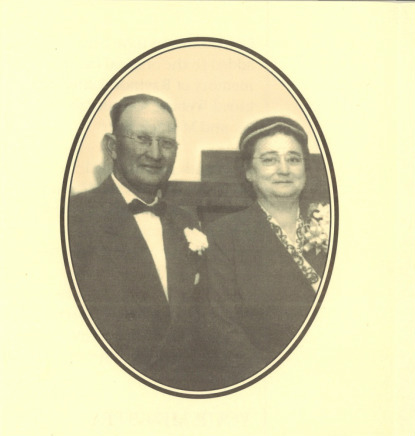 The Harold H. & Velma V. Schooler Memorial Scholarship Fund was established in 1977 by the family and friends of Mr. and Mrs. Schooler. Their Children wanted a lasting memorial to benefit the community with the contributions made after the death of Mrs. Velma Schooler on February 15, 1975, just eight months after the death of her husband, Harold on June 10, 1974. The Schoolers were born and lived their lives in Jasper County. They reared their six children in the Zion Community where they were active memebers of the Zion Baptist Church. Upon their retirement from farming, they moved to Carthage and became members of the First Baptist Church there. The scholarship was begun and has been maintained by their children for the communities of Jasper County. The Schooler's love for the church along with their active involvement in the churches has been a model for their family and firends. Their influence live on in the contributions made to those who are preparing for ministry and church related vocations. Contributions have been added to the original funds in memeory of Raymond Ziler and Lloyd Webber, sons-in-law of Mr. and Mrs. Schooler. The funds are managed professionally by the Missouri Baptist Foundation to provide annual amounts that are awarded to student applicants by the selection committee according to the guidelines extablished by the Executive Board of the Spring River Baptist Association in April 1977. The scholarship may be used at any Southern Baptist college or seminary or any school of the applicant's choice with the approval of the scholarship selection committee. Applications forms are available at Spring River Baptist Association or fill out the online form and must be returned by March 1st. 1. The Mr. and Mrs. Harold H. Schooler Scholarships are granted to studnets who have a "clear" call to ministry or church related vocation to attend any Southern Baptist school, or MSSU, Joplin, or a school approved by the Scholarship Committee. 4. Scholarship checks will be made jointly to the student and the school he is to attend. The second half of the scholarship will be forwarded prior to the beginning of the second half of the school year, following a favorable report form an official of the school concerning the student. 5. Eac scholarship shall be in the amount determined by the Committee upon evaluation of the application, for the academic school year, payable as indicated under "3" and "4" above. 6. The application and all related items must be in the possession of the scholarship committee by March 1. The Committee will make an effort to notify the applicants of the awards by May 15. 7. Upon submitting this application, the applicant commits himself to use any money received from this scholarship fund for the exclusive purpose of furthering his education as indicated in this application. 8. Upon the receipt of the scholarship a thank you letter should be written to the Schooler Family and sent to Spring River Baptist Association.